Note: The web master for this site is no longer associated with this unit, and has not been for several years, which is why much of the information is outdated. The history portion of the site is updated occasionally: http://www.b-1-105.us/wmh.html. The information and photographs related to Bravo Troop will be left as is for now; it is part of history as well. Bravo Troop’s attendees at the Squadron Dining-out. Bravo Troop’s attendees and their guests at the Squadron Dining-out. 5-ton joy ride on 3 Aug.
Hasty TCP on 5 Aug. Pulling security during hasty TCP on 5 Aug. Checking ID during hasty TCP on 5 Aug.
Inspecting a vehicle during hasty TCP on 5 Aug.
Another unit conducting ECP training at the FOB on 6 Aug.
Another unit conducting internal QRF training at the FOB on 6 Aug.
Interacting with the locals during external QRF training on 6 Aug. Conducting an AAR on 6 Aug. Pulling security during external QRF training on 6 Aug.
Searching a house during external QRF training on 6 Aug. Preparing to search a local during external QRF training on 6 Aug.
Glass house on 7 Aug.
Reflexive fire training at the FOB on 7 Aug.
A view of the FOB on 7 Aug.
A view of the FOB, and reflexive fire training, on 7 Aug.
Ruck march from the FOB to the MOUT training area on 8 Aug.
MOUT training on 8 Aug.
MOUT training on 9 Aug.
Wisconsin's Adjutant General visits our MOUT training on 9 Aug.
Wisconsin's Deputy Adjutant General for Army visits our MOUT training on 9 Aug. The SQDN CO participates in our MOUT training on 9 Aug. The SQDN CO & CSM participate in our MOUT training on 9 Aug.
Ruck march from the MOUT training area to the FOB on 9 Aug.
Convoy training on 13 Aug.
Convoy training on 14 Aug.
Brat fry on 15 Aug.
MOUT training on 16 Aug. Grenade range on 17 Aug. Zero range on 18 Aug.
Qualification range on 18 Aug.
Mk-19 range on 19 Aug.
M-240B range on 20 Aug. The finest collection of Citizen Soldiers in the Wisconsin Army National Guard (20 Aug.)! Check out our Photo Archive for previous photos of Bravo Troop In Action. Check out our Video Archive to see more of our Soldiers In Action! 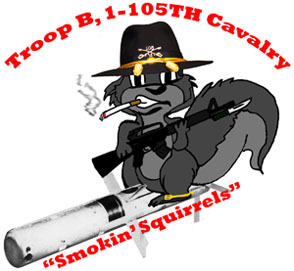 Disclosure: Troop B, 1-105TH Cavalry's web site is an unofficial web site. Neither the Wisconsin Department of Military Affairs, the U.S. Army nor the Department of Defense have authorized, endorsed or otherwise influenced the compilation of these pages.